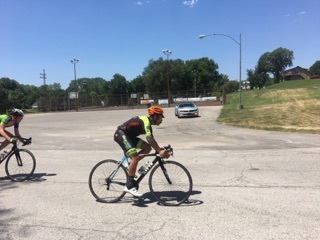 The Truman cup is a series of races that start with a 5.6 mile time trial on Friday night then on Saturday there is a 3 mile circuit race that is a 4 lap race. Sunday is the 45 minute crit. 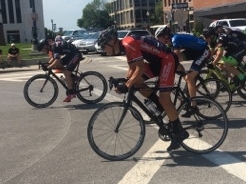 All of the races took place in Independence MO this weekend. During my race weekend in Lacrosse, WI I met a few fellow cyclist. One of the guys I met that weekend was Ryley. We hit it off immediately. Ryley was a new cat 5 and was fast, I mean, I would put him up against or in any cat 3 race and he would easily beat half of the field. So, Ryley decided to make the 9 hour drive down to KC for this race, and I am glad he did. Here is a picture of Ryley and I tooling around the city. Another friend that came in for the race is DK from San Diego. Of course she did not drive:) DK and I will be doing the RAGBRAI this week. RAGBRAI is a ride across Iowa. Not sure why it’s not a race, seeing how you probably want to get across it as fast as possible. I am kidding, Iowa is pretty cool and so are the folks that call it home. You will hear more about DK over the next week. We have way to much fun and will hope for no injuries and or arrest this coming week. Thank you DK for all the cheers during the race. 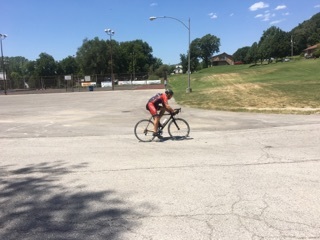 Friday – The Truman Cup Time Trial. This is a solo event so you have to go as fast as you can for 5.6 miles. The last 300m is basically where you empty the tank. Ryley and I headed out to Independence a little early to get the legs warmed up and check out the course. Fairly flat and a pretty good road. All start times were just after 6pm and each racer would start 30 seconds after the next. My goal is always to catch the rider in front of me. After that 9 hour drive I knew his time trail would suffer, and it did. He placed 11th and I took 6th with a 13:26 time, Fastest I have done on that course. During the TT we met some guys from St. Louis that were in town for the entire series. Super nice guys from a few different teams. To celebrate we decided to head out to Lulus. Possibly my favorite Thai restaurant in KC. So, while we were at the restaurant Ryley and I were talking about dating and how I find cyclist attractive. He was explaining how I should ask out a non cyclist. So, with out hesitation I point to a server and asked Ryley if maybe I should ask her out. As he shrugged his shoulders she walked by and I politely asked if she would give us a moment of her time? She stopped and said “of course, whats up”. I proceeded to ask her if she would like to go out on a date. I think Ryley may have been a bit uncomfortable with this whole experiment. Me? on the other hand, I was eating it up:) She was in a relationship and was super nice and went on to explain how when she was in roller derby a lot of the dating happened in the roller derby circle and that most of those relationships didn’t work after they left the sport. I don’t believe I will be leaving cycling anytime soon. 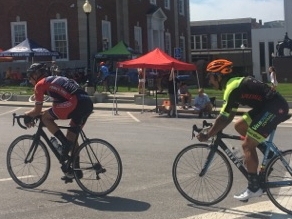 Sunday – The Truman Cup Crit. With less than a mile loop, 6 turns and 45 minutes of racing, this is never a dull moment. This race had 51 racers in it and was as fast as it has ever been. We did 18 miles at about 26mph and it looked like the island of misfit cyclist. There were about 30 different teams. Ryley and I held on to the front most of the race and possibly worked harder than we should have but, that’s racing. He took 6th and I placed 16th. Overall we were 4th and 10th in the 3 day Omnium. I was proud of us both! Always have to give props to the women’s free state team. They always win and look good doing it. Great job ladies!